This book provides a comparison of two contrasting paradigms that influence – positively or negatively -- the ability of leaders and their organizations to solve complex business problems. The authors examine the unquestioned assumptions that form each of the paradigms and leadership behaviors/actions triggered by their assumptions and the outcomes of these actions. Further, they provide information on how to model new behaviors that are based on effective assumptions for complex problem solving. The authors draw on neuroscience, complexity science, Gestalt theory, and their own observations to offer a new way of leadership that allows leaders to facilitate meaningful change in their organizations. 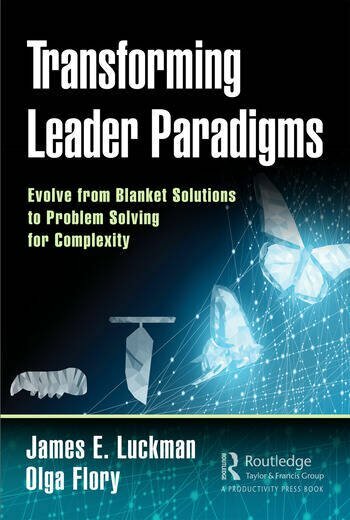 The book provides guidance to leaders on how to accomplish a paradigm shift to move away from blanket solutions toward deliberate problem solving. The authors demonstrate how the practice of deliberate problem solving helps build the culture of trust and respect, boost employee engagement and achieve operational excellence in serving the customer. Applying Ed Schein’s definition of organizational culture as "a result of what an organization has learned from dealing with problems and organizing itself internally", the authors describe leadership assumptions, behaviors and practices that help build the culture of deliberate problem solving in order to help leaders understand their role in driving culture change in their organizations. Despite extensive and expensive programs, companies have not been successful at making the cultural changes needed to stay ahead of today’s turbulent business environment. It is widely acknowledged that over 70% of transformation efforts fail. This is largely because most change efforts come from senior leaders assigning an external or internal consulting group to drive change from the top down through a formulaic and programmatic approach (i.e., Six Sigma), with little understanding of their role in leading the change process. Another issue with cultural transformation efforts for the purpose of building the culture of continuous improvement/lean/operational excellence is that most organizations focus on the deployment of tools. At a process level, they introduce kaizens, value-stream mapping, tools for reducing inventory, tools for creating flow, etc., and, relative to the management system, the focus is typically on team huddles, huddle boards, tracking boards, problem solving meetings, skill matrices, etc. None of the above works if an organization’s leaders operate under the influence of the paradigm of "blanket solutions". Our book examines the set of assumptions that form from this paradigm and proposes an approach for executing paradigm shift. And, because he was willing to take on these difficult tasks, he has been blessed to be a part of solving some of the bigger technological and management puzzles of our time. For example, Jim was the lead product engineer responsible for developing the first digital computer on a car, a 1977 Oldsmobile Toronado. He would later be a vital member of a General Motors team that designed the first computers installed on all cars to meet 1981 emission standards. Olga Flory was the Director, Lean Academy, Global Leadership, Learning and Talent at Liberty Mutual Insurance. She lLed a team to develop and deliver best-in-class learning experiences for continuous improvement and business leaders globally. In addition, she consulted with the business to align learning solutions with strategic priorities and focused on helping leaders develop a growth mindset to enable the business deliver maximum value to the customer. Previously, she was the Director of Education at the Lean Enterprise Institute where she helped companies and organizations around the globe to develop leaders and improve business practices in support of their lean transformations. She collaborated with the Lean Global Network, LEI faculty and business leaders on the development of new lines of products and services and was owner of the Education value stream: strategy, execution, P&L, team management.